TRS Working President KTR met YCP Chief YS Jaganmohan Reddy on Wednesday to discuss about the Federal Front proposed by Telangana CM K Chandrasekhar Rao. 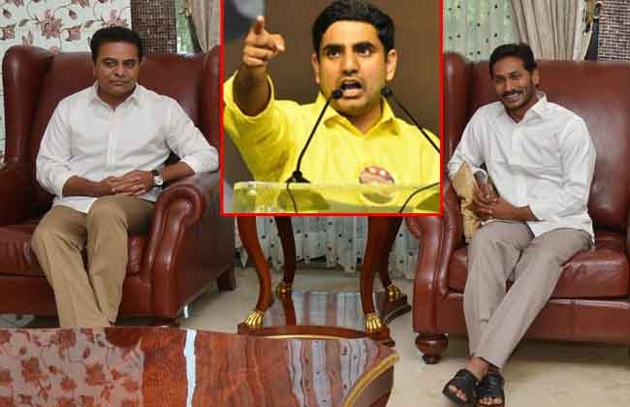 This is how Nara Lokesh responded on the meeting: 'Delhi Modi, Andhra Modi, Telangana Modi got united. Secret Pact continued between them so far has become official now. Jagan has been establishing Andhra Drohula Front teaming up with KCR who has been creating hurdles for the implementation of Bifurcation Promises'. Lokesh recalled KCR saying all of those who were born in Lanka are Rakshasas and those in Andhra are their successors. 'Modi and Jagan joined hands with a person who insulted Andhrites,' he commented. Rest of the AP Ministers followed their Jr Boss in this aspect. Minister Devineni Uma questioned how could YCP maintain ties with TRS which filed cases to stop Polavaram. Finance Minister Yanamala described KCR's Federal Front as Keelu Bommala Front formed at the behest of Modi. He went on to say Jagan-KTR Meeting happened as per Modi's direction. YCP Spokesperson Ambati Rambabu slammed TDP Leaders for launching bad propaganda against Jagan. He clarified TRS Leadership has been holding talks with the Presidents of various regional parties in the country for Federal Front and Jagan is one of them. Ambati ruled out any scope for alliance with TRS and reiterated YCP contests in all the 175 Assembly Seats. He maintained Jagan has never changed his stand on the Special Category Status unlike Chandrababu Naidu.